A top official at the Republican National Committee, Sean Spicer, bragged about launching a "Willie Horton-Style" attack ad against Democratic vice presidential candidate Tim Kaine one day before the vice presidential debate. 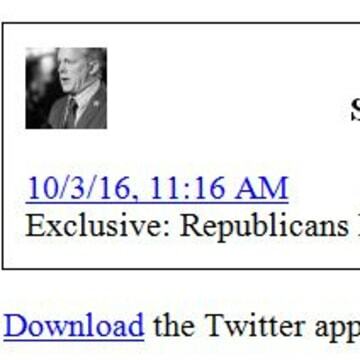 After being criticized for praising a style of attack ad that was considered too ugly even for politics, Spicer deleted the Tweet about two hours after it was published. The new anti-Kaine digital ad he was referring to says that Kaine "consistently protected" the "worst kinds of people," pointing to his legal defense of convicted violent felons. The now-infamous Willie Horton ad was used against Democratic presidential candidate Michael Dukakis by challenger George H.W. Bush in the 1988 campaign. When Dukakis was governor of Massachusetts, Horton, who was serving a life sentence for murder, raped a woman during a weekend furlough from prison. The ad played into racial fears and is credited for costing Dukakis the election. But it was also widely condemned and Lee Atwater, the former chair of the Republican National Committee who approved the ad, later apologized for it. Spicer tried to defend his Tweet, saying he was just quoting the headline of an article reporting on the ad.